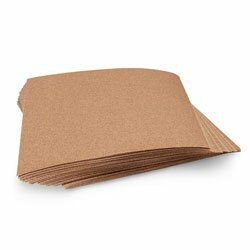 Norton Sandpaper - Medium (100 Grit) Pkg of 50 Sheets - Arts & Crafts Materials - 9714789 B: For dry sanding hardwood metal and composites by hand or machine. Long-lasting aluminum oxide abrasive is open coated on high tensile paper. 9" x 10" sheets.